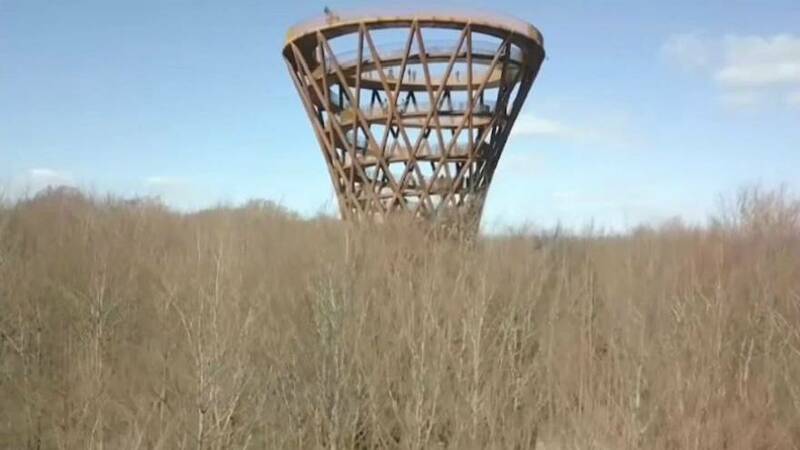 A 45-metre hour-glass observation tower has opened in a Danish forest. The Camp Adventures Forest Tower — built in the Gisselfeld Castle Forest, about a 50-minute drive from Copenhagen — is now the highest point in the Zealand region, coming in at 135 metres above sea level. Towering 20 metres above the tree line, it offers an uninterrupted 360-view of the area to visitors who walk the 650-metre twisted path to the top. "I thought it was fantastic. It is kind of disorienting, going all the way up to the top, but it's nice how you can touch the trees in the middle," Gary Hamilton, a visitor from Ireland, said. "You feel kind of unsteady, but then when you get to the top it's like this big reveal so I thought that it was really good. I thought it was fascinating," he added. The structure is made out of untreated steel and 7,750 pieces of oak tree. "It's sustainable wood, oak wood, untreated, so when you need to shift it you can just compost it in the forest and it will be feeding the insects," architect Tue Hesselberg Foged explained. "The whole idea is to bring lots of people into the forest for a completely unique forest walk. It's kind of a vertical forest path that takes you from the forest bed, through the tree trunks and up where the wind is blowing in your hair and you feel vertigo and you can see all over the countryside," she went on.